Quiz: Grab Your Cheesecake! How Well Do You Know The Golden Girls? 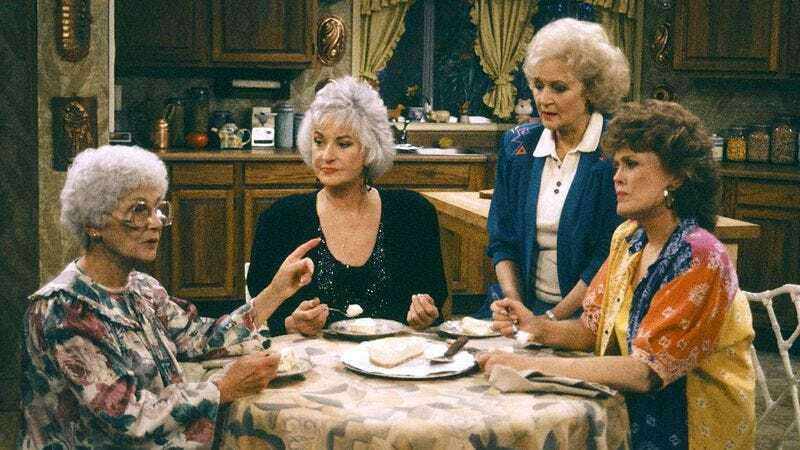 You've probably traveled down the road and back again to watch The Golden Girls reruns several times before, but are you ready to apply what you’ve learned to a quiz about your favorite badass roommates? For seven wonderful seasons, we all got to know Blanche, Dorothy, Rose, and Sophia as they navigated their golden years together. From new love interests, to hijinx at work, to typical (hilarious) family drama, it was like being a fly on the most entertaining kitchen wall in America. Casual fans will be able to match Bea Arthur, Rue McClanahan, Estelle Getty, and Betty White to the names of the Golden Girls they played, but in order to take the blue ribbon in this quiz, you’ll have to dig a little deeper. We’re talking job titles, birth cities, boyfriends’ names, and even the name of Rose’s teddy bear. Think you have what it takes to be the fifth Golden Girl? Put down your replica of Sophia’s purse, get comfortable, maybe throw on an episode in the background, and brace yourself for a fun ride down to 6151 Richmond Street. A pop culture crazed writer with a gigantic love for The Golden Girls.